Amazon has just published the Kindle Edition of my 2002 book, The Laws of Change: I Ching and the Philosophy of Life. It is now available for 9.99 at the Kindle store. As important to Chinese civilization as the Bible is to Western culture, the I Ching or Book of Changes is one of the oldest treasures of world literature. 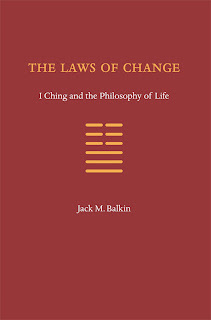 In this masterful new interpretation, Jack Balkin returns the I Ching to its rightful place as a book of wisdom that teaches how to live one's life in a changing and confusing world. Balkin's comprehensive and perceptive commentaries highlight a clear, understandable version of the core text of the I Ching that preserves its striking imagery while remaining faithful to the long tradition of ethical interpretations of the work. The I Ching is nothing less than an explanation of the laws of change in the world and how human beings can learn to live in harmony with them. Balkin presents it as a work of practical philosophy and ethics, concerned with helping people to cultivate their characters, achieve emotional balance, and maintain personal integrity in the face of adversity and ever-changing circumstances. He shows how the I Ching's divinatory system helps the reader discover the book's underlying philosophy through applying its insights to everyday problems. The Laws of Change: I Ching and the Philosophy of Life offers the most detailed commentaries available in English on the I Ching's ethical and philosophical teachings, a comprehensive survey of different methods of consulting the I Ching, and an excellent history of the I Ching's transformation from a Bronze Age diviner's manual to a beloved book of wisdom that lies at the very heart of Chinese culture. This is an indispensable work for anyone who wants to understand the I Ching and its history.